In the midst of World War Two a pair of British pilots are shot down over enemy territory. Injured and in desperate need of cover from the approaching troops, they board a train full of injured SS Officers. Panicking they steal the identities of two of the severely wounded thinking only of survival. 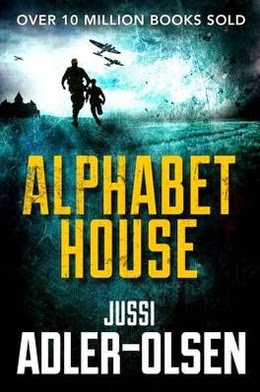 They are unaware that they are being sent to Alphabet House, a mental hospital for important officers in the Nazi regime. Bryan and James must stay silent, simulating madness in order to get through the days of shock treatment and sedative pills. Little do they know that there are others on the ward who may not be quite what they seem. Weakened by treatment and unable to communicate with each other, the two friends must find a way to escape. This is an extremely detailed novel which asks important questions about the nature of madness and the effect of prolonged treatment on healthy minds. It is a story which deals with friendship in the face of adversity. Adler-Olsen gets inside the head of the reader with a plot that twists and turns in unexpected ways. It's an interesting, thoroughly researched novel from the author of the Department Q series.